For the first time in a few years I'm going to have a co-reviewer on Beer O'Clock Australia. The plan is that we'll divide the duplicates at soccer soon after they arrive. We'll both drink them individually and record our thoughts, before getting together to share the single beers in the pack (and possibly a few more!). I think it's fair to say that we've settled on this format for the time being. As usual feedback is always welcome via the usual channels. This pack was a little different, with 4 duplicates and 4 singles making up the 12 beers. Both Dylan and I had sampled quite a few of these previously. The standouts for me in this pack were the Hobart Brewing Co. Xtra Pale Ale, a brewery I haven't had a beer from previously, and the BrewDog Ace of Equinox, their beers are always good. I've also heard positive things about the 3 Ravens, whilst the pack will also give the Sierra Nevada Sidecar a chance to redeem itself about a pretty inauspicious first tasting. 3 Ravens have really gone up in my estimations over the last year or so. It's based on a traditional German Pilsner, but utilizes a range of Australian hops (Ella, Summer and the experimental HP-035) and malts in combination with a Bavarian lager yeast. It's a beer that I was really quite keen to try. "Super smashable! There’s not a lot to say about it and I suspect this is what the brewers at 3 Ravens would have wanted. With that said, I did like how subtle the fruity/floral hops were while still being present. It’s very well crafted. 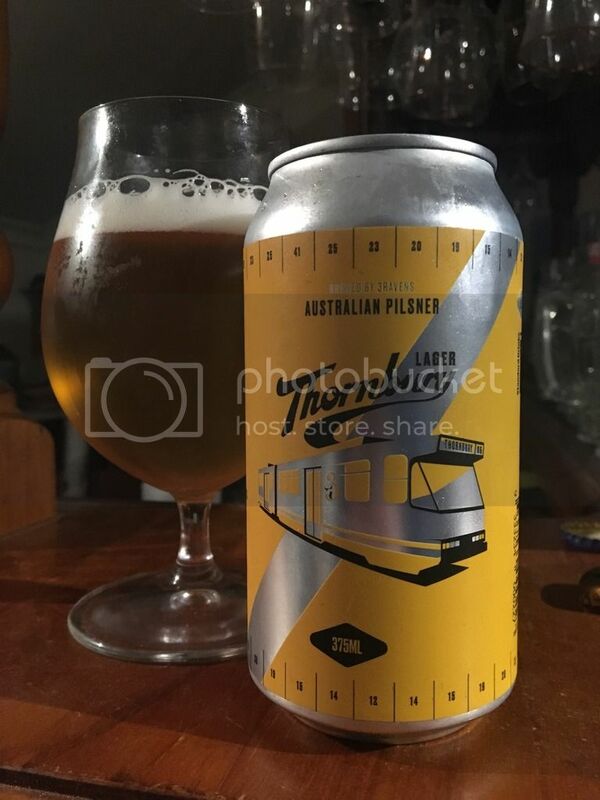 There seems to be a big trend of suburb based beers going around at the moment and I’d put this up there with the better ones (Coburg Lager, Footscray Ale) rather than the not so good ones (which I’ll refrain from naming)." I was really impressed with this lager. Lager's are widely derided by the Australian craft beer community but I feel that this one could change that. It's wonderfully well rounded and incredibly easy to drink. I'm sure I'll be drinking more of these in due course. 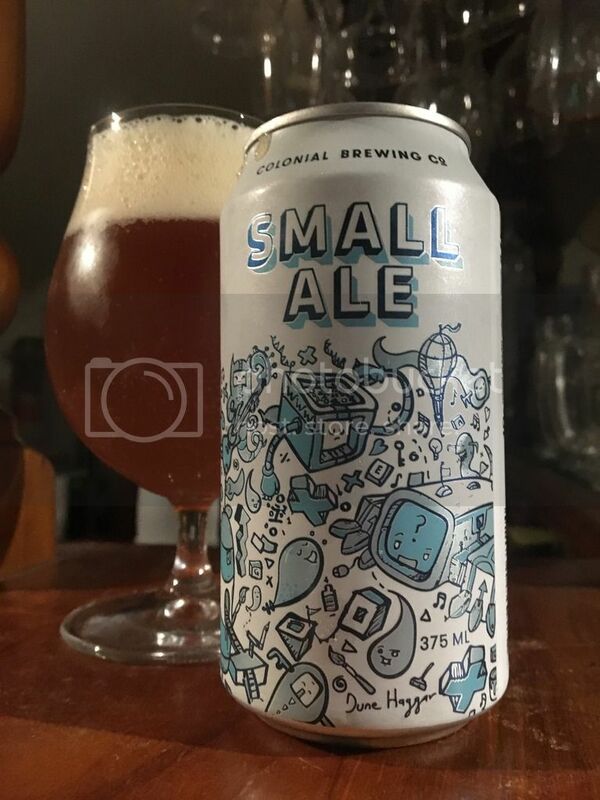 The Small Ale from Colonial is a beer that I've become quite familiar with since trying it for the first time as part of the Hottest 100 Beers last year. Packaged in those wonderful cans where the whole top comes off, the beer is something of a hybrid of styles. What is certain however is that it's a damn tasty little beer! "Nailing down the style of this beer is tough and Colonial themselves seem loath to call it anything in particular. It has been made as a scaled back IPA though so I’d put it in the session bracket of that particular style if pushed. Onto more important notes, this is a beer that has really grown on me. I first had it early last year while over in Perth, attracted by the eye catching design and ring pull cans (which I still really, really like). It impressed me then and has become a staple ever since, packing a lot of flavour into a mid-strength beer. It has a good whack of bitterness but is still light enough to easily drink all day." As I mentioned earlier I was pretty disappointed when I tried this beer a couple of weeks ago. Sierra Nevada very rarely miss, however this was a pretty boring Pale Ale with a hint of citrus, which is clearly orange from the label. It was a touch better than I recalled, but it was still lacking in flavour and was a bit boring. 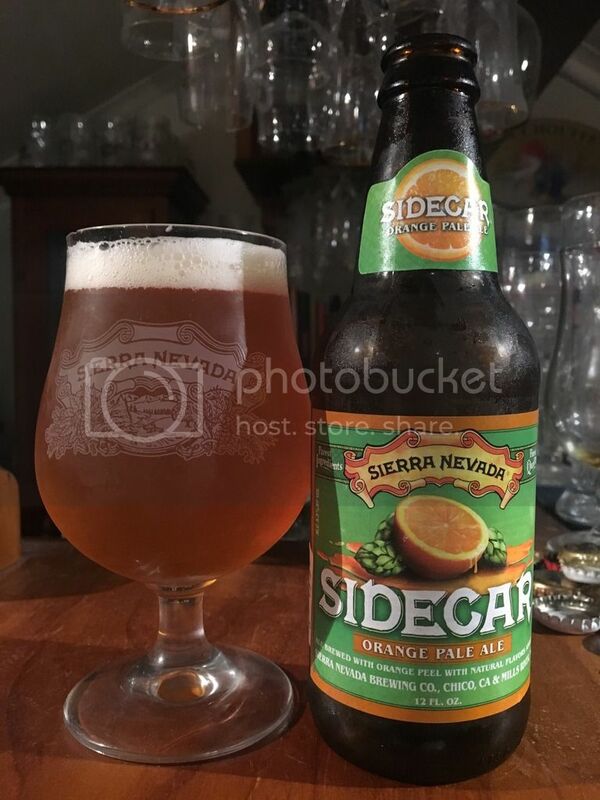 "When I heard Sierra Nevada were making an orange pale ale I was excited — I love a fruity pale and they obviously know how to make a standard pale bloody well! It’s brewed with Mandarina hops (as well as more standard US ale hops) and orange peel to give it the orange elements they wanted to bring out. Sadly, I just found this to be a super bland beer. Wanting to give SN the benefit of the doubt I’ve had it a few times but I can’t imagine purchasing another after this one from the Carwyn pack. There’s orange on the nose but it’s super light in the actual pale, which just feels like a pared back version of their standard pale. It might work as a gateway beer for those looking to get into hoppy beers with fruit additions but to be honest there’s a lot of better options in that department too. A real disappointment." I've been a fan of this beer since it's first release as a limited edition run in 2012 (I think it was 2012 at least!). 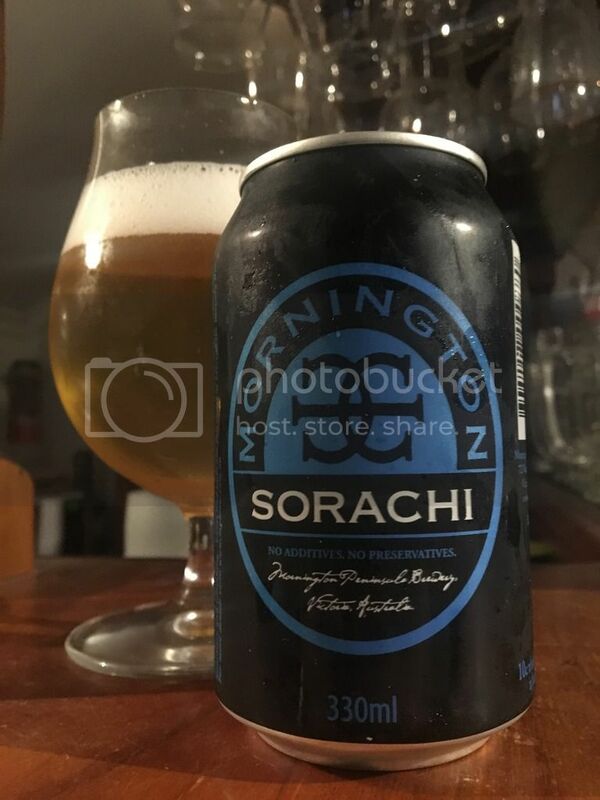 Back then it was called Sorachi Kölsch, and I even reviewed it in full!With this beer now being available at Dans now, in very reasonably priced 4-packs, I'm going to be drinking a lot more of these! "This is a good kind of “grab a few cans and head to the park/beach” style beer. It’s fairly light and compact, goes down very easily. There’s obviously a fair bit of Sorachi (probably unsurprisingly!) in here, with the trademark lemony characteristics showing themselves well. Lightly tangy and crisp on the finish. Not a game changer but I have no real issues with it, does what it sets out to do well!" 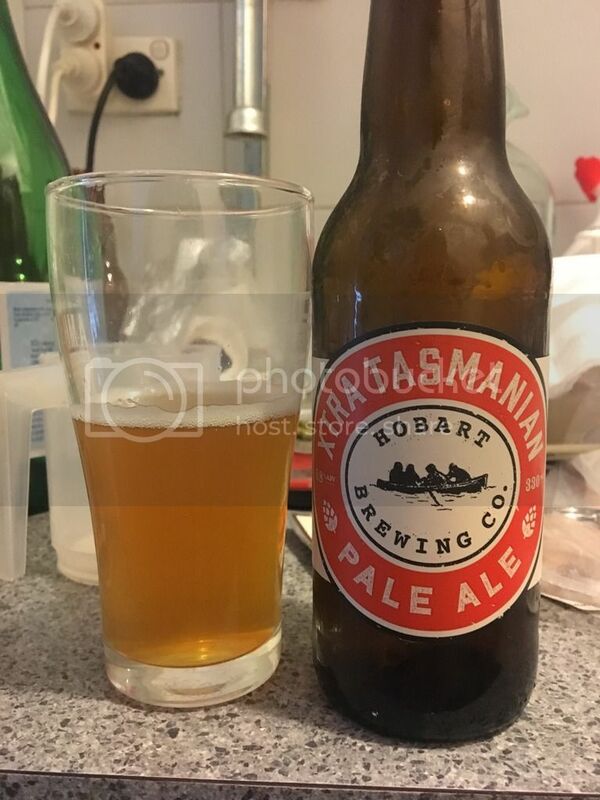 Hobart Brewing Company was a brewery I've never had the pleasure of sampling. I was hoping to try some of their wares at Melbourne BeerFest, however they didn't show... I don't believe they have their own bottling line at this stage, although little information is easily available. This offering was bottled, and I assume brewed, at Hawkers. "A very solid pale ale. Apparently the first bottled release from the brewery, it sits in that awkward territory where it’s hard to find fault with what it’s doing but at the same time is hard to strongly recommend due to the lack of standout attributes. Putting that aside I really enjoyed the bottle I had, with the hops more on the piney/citrus end of the spectrum than tropical fruits. Good strong bitterness comes from this, with the IBUs weighing in a fair bit higher than your everyday pale while still retaining overall balance." 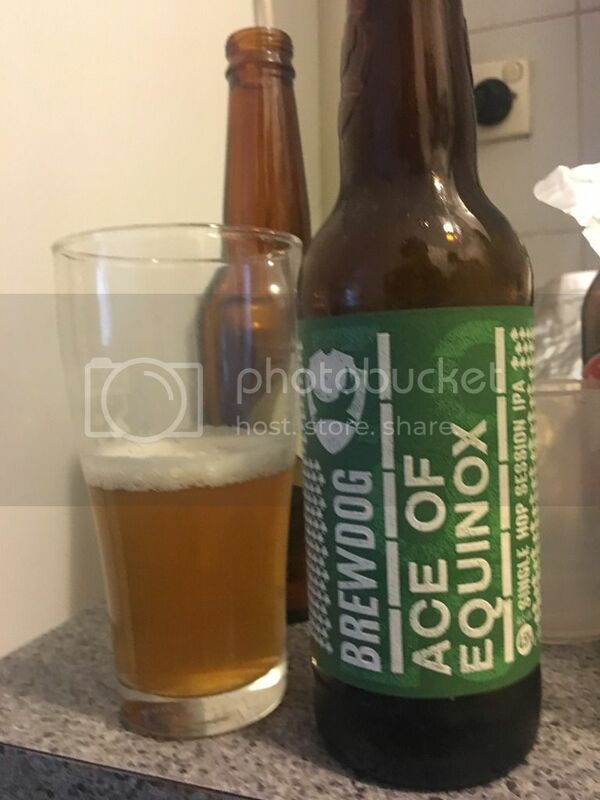 Equinox is a hop that BrewDog have used in a single hop before. One of their IPA is Dead beers from 2014 was the experimental EXP 366; a hop that would later be renamed Equinox. If I'm being honest I didn't love that beer, however I did say I thought the hop would perform better in a lower ABV setting... And here we are! "I’m a big fan of single hop releases, especially when it’s one I’m not particularly familiar with which is the case with Equinox. It clocks in at a surprisingly low 4.5%, with an obviously light malt base letting the hops shine, and shine they do. I got a lot of pine and citrus, mostly lime, as well as some pawpaw and mango undertones. 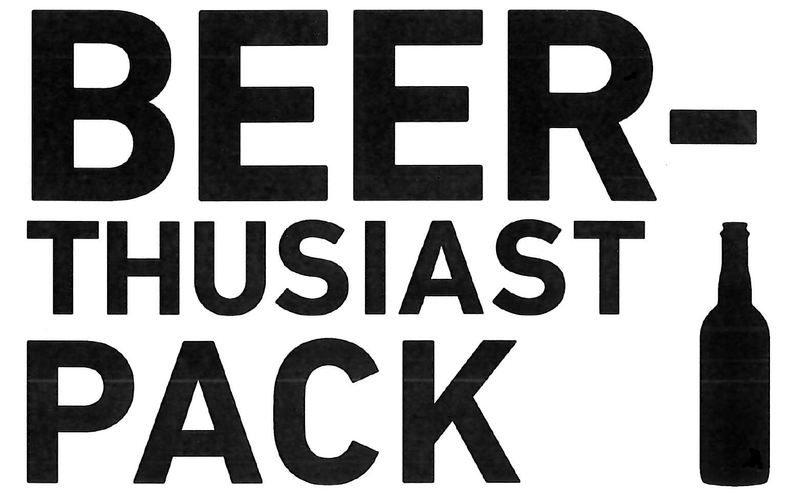 It’s a really solid beer and a great hop choice for a single hop release." BrewDog almost never disappoint! This was no exception as I thought this was the standout beer of the pack, one of the few areas Dylan and I disagreed in this pack. The malt base is light, but just solid enough to lay a foundation for the hops to do their thing. The citrus flavour is really interesting with lime dominant, but grapefruit also there. The beer is rounded out by really nice tropical fruit flavours as well as some interesting grassiness. "Apparently past versions of this have been pretty spectacular. I’m not sure what went wrong with this one. Strangely sweet, stale and dusty malts give way to strong bitterness that seems to exist without any hop flavour. There’s no real balance and the individual elements don’t work well. 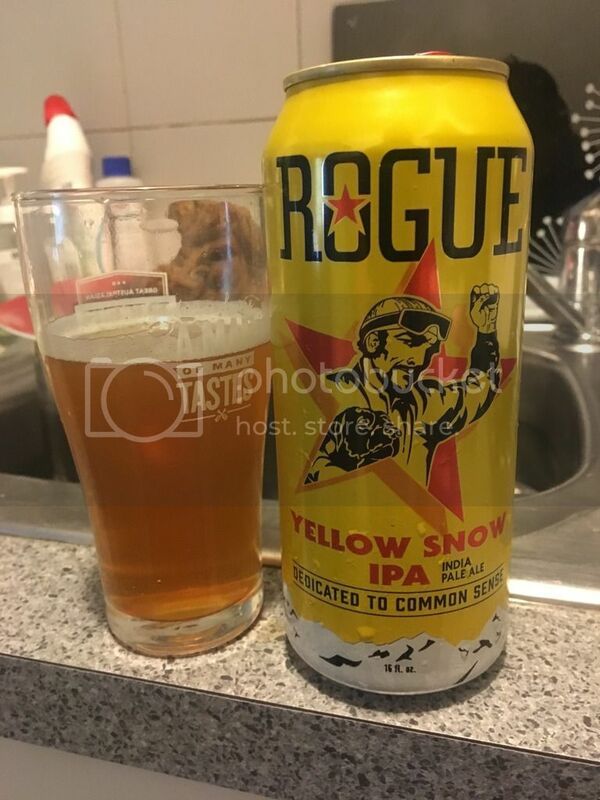 I didn’t outright hate it but it was certainly the most underwhelming beer of the pack and not something I’d revisit unless I was assured it was back at the quality others have spoken of it being at in the past." This was one of the worst beers I've had this year! Admittedly I curate the list of what I drink to avoid beers that I don't think will be up to it, but still... I was bitterly disappointed in this offering and would really hope to put this down to a canning issue/bad batch. This was always going to be a pretty special beer. 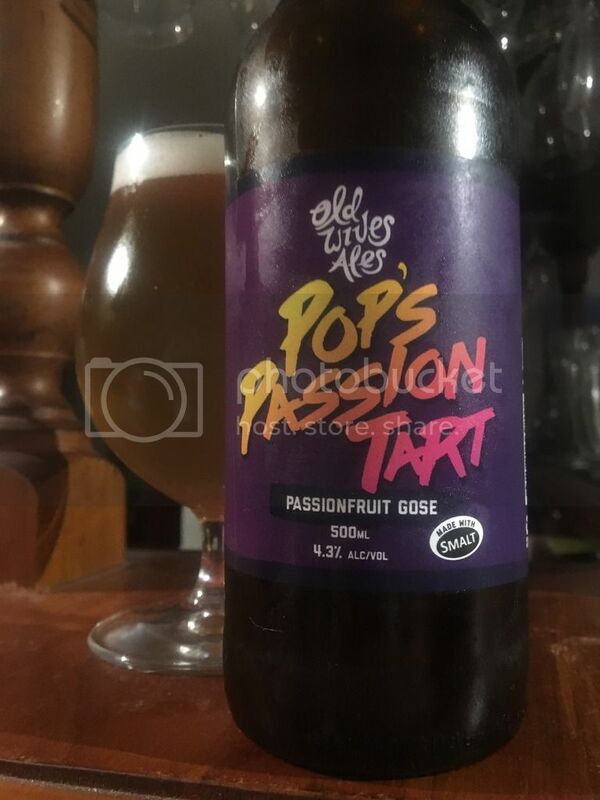 Old Wives Ales teamed up with SMALT, a craft salt producer, to turn their wonderful Pop's Passion Tart Berliner Weiss that was brewed for their first birthday into a Gose. They've utilized "apple wood cold smoked salt flakes" in combination with the passionfruit pulp that made the Berliner Weiss so striking. "Carwyn have a knack for throwing excellent sours into their packs and this is no exception! OWA have hooked up with cold smoked salt producer SMALT for this beer to give their gose a real point of difference. It works incredibly well, with the passionfruit up front melding with the tartness of the beer before giving way to light smoke and a dry, salty finish. It adds a real meaty, savoury note to what may otherwise be a fruit driven gose. I like it more every time I have it." Apologies all for the delay in getting this post, and numerous others I've promised recently, up; I've been swamped by Financial Management as part of my MBA. I quite enjoyed the beers in this pack, although I'm not sure that there was a real "WOW" beer. 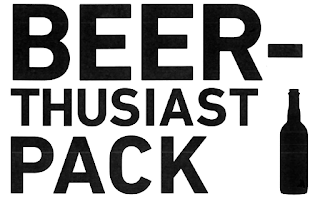 The April pack has already been delivered to Beer O'Clock Australia HQ and Dylan and I have both consumed most of them - it should be a pretty interesting review, which I'll hopefully get up more expeditiously!